I'm new to the forums and semi new to pixel art. These are some things i have completed. Please tell me what you think and tell my what i can improve on. Well, I'll just focus on the shark for now. What to do regarding this? I say study basic drawing on the side. You don't need to drop pixeling entirely for the duration, but studying on the side certainly will improve your abilities as a pixel artist. Not very good at living creatures more items and terrain. What do you think about the swords. I'm not sure about the shading. Hm, I think the swords could use a lot less colors. The more you use, the softer and rounder the item turns out to be -> loses clarity. In general, my suggestion would be to use as few colors as you can get away with, and add a new color if you are starved for detail. 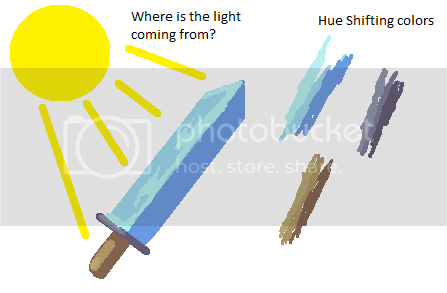 In this picture I'd say you could reduce the colors on the blade to 4 colors - a dark shadow, an antialias color, the normal color and a highlight color. 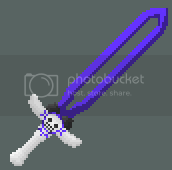 The bone only needs 3 and the black area probably just 2 since it isn't very shiny looking. 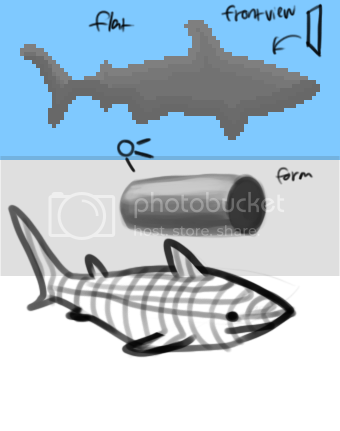 http://www.pixeljoint.com/forum/forum_posts.asp?TID=11299&PID=139322 This tutorial might prove very helpful! Okay, I went a little nuts with it. 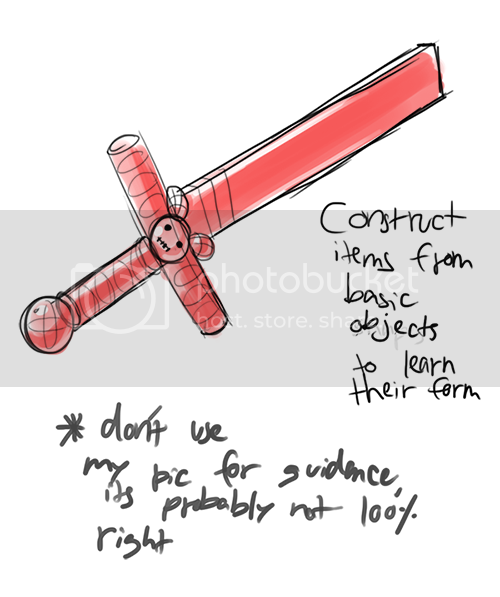 Basically what ninjus said, you have to first define a light source. In yours, a light source is clear but it is shown by a great big clump of banding. (read up on banding here http://www.pixeljoint.com/forum/forum_posts.asp?TID=11299&PID=139322#139322) Instead, think of the sword as a 3d figure. Where would the light hit the most? Where would the light hardly hit? Wow Thanks everyone for all your amazing support! I can't wait to try out these new techniques. The reduced colors certainly improve it, however you need to make the colors more different from each other. Also reducing the vividness of the shadow and highlight would help (as well as changing the hue, for example to a more reddish purple in highlights or a more blue purple in shadow). You still haven't really brought out the shape of the bone with the shading, as it mainly hugs the outline of the form. Edit2: I apologise profusely if my advice is suspect, Im a bad educator. Definitely better. I think you should change the design on the blade a bit, the two sides are thin and don't look very sturdy, also the small area makes it difficult to shade. I would suggest filling in the middle with white, connecting the two ends. Another thing is that your sword needs a bit more contrast, mainly the darkest should be pulled down a bit more I think. I made quick edit to show what I mean. Good work so far. Also, you don't need to increase the size before posting, there's a feature on the forum where you can click the image to make it larger.